In the fifteenth century, European nations clashed in search of a direct route to India and its spices. But of all the kingdoms, Portugal, with its intrepid navigators, proved the most daring: in 1488, Bartolomeu Dias managed to cross the formidable Cape of Good Hope. And, ten years later, Vasco de Gama was the first European to reach the legendary Calicut, India, after a tumultuous journey along the African coast. This resounding feat gave Portugal the monopoly of the spice trade between India and Europe. 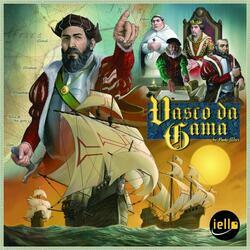 In Vasco da Gama, players play the role of rich shipowners seeking, under his patronage, to accumulate prestige and wealth. To succeed in this endeavor, they must manage the money and the actions at their disposal in order to hire captains, recruit crews, build ships, put them afloat and send them to the stopovers of Natal, from the Land of Boa Gente, Mozambique, Malindi, Mombasa and Calicut.